Could ‘Uber for buses’ be the solution to Melbourne’s transport woes? There’s a widely held perception that Melburnians don’t like buses. This is not entirely true. Certainly it’s the case that Melburnians don’t like slow, inefficient buses that don’t take them where they need to go, or connect seamlessly with trains and trams. But where buses provide direct, frequent and quick connections to jobs or services, people use them in droves. 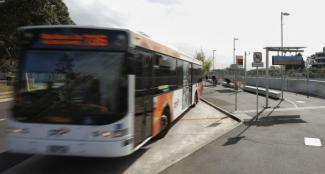 The 401 bus connecting North Melbourne Station with the Parkville medical and university precinct was instantly successful when it was introduced in 2008 and continues to be one of Melbourne’s most patronised bus routes. It’s a similar story with the 601 connecting Huntingdale Station to Monash University. This service operates every 2-3 minutes during peak times and has strong patronage right across the day. Between them, these two bus routes carry almost 7000 passengers every day. The Brimbank bus upgrade and introduction of frequent, orbital “SmartBus” routes are other success stories, both resulting in significant patronage increases. In the case of SmartBus, patronage increased 70 per cent in the first two years and has continued steadily ever since. What these examples tell us is that Melburnians will catch good bus services. The problem is, many bus services in Melbourne are simply not up to scratch. Our analysis shows 40 per cent of Melbourne’s bus network is under-performing. Services are infrequent and meandering, and in some instances almost empty. Many operate under outdated contracts that allow little flexibility to alter services and don’t provide value for money to taxpayers. An overhaul of Melbourne’s bus network is required. Contracting arrangements for all of Melbourne’s buses need to be modernised and brought into the 21st century. Successful bus routes then need to be expanded to provide more frequent services, and under-performing routes potentially replaced with more demand-responsive options. These pre-booked, shared transport services are flexible and adapt to customer demand. Unlike a typical bus, demand-responsive services change routes and vehicles to suit the number of passengers who want to travel and their destinations. Think Uber for buses. As patronage grows, demand responsive bus services can be scaled up to cater for increased travel demand until it becomes necessary to upgrade to a standard bus services. The potential of demand-responsive buses highlights one of the great advantages buses have over other transport modes – flexibility. Buses can operate on almost any part of the road network, meaning routes can quickly be altered in response to a disruption. Services can be increased or decreased quickly depending on shifts in technology, policy and behaviour, and don’t require expensive infrastructure investments. This is not the case with train or tram services. That’s not to say investment is not required, it is. Indeed, we want government to increase investment in bus services in areas where there is proven demand and contracts deliver value for money services. But even a major investment in buses requires significantly less funding than train or tram initiatives. Buses provide enormous bang for buck. We’ve identified some locations where providing additional bus services have significant potential to improve the performance of the road network. These are locations where there are large numbers of people wanting to get to clusters of jobs, universities and services. Having people travel to these locations by private vehicle is desperately inefficient, clogging our roads and increasing travel times. A direct and frequent shuttle from Victoria Park Station to Parkville would provide faster access to a thriving employment precinct and reduce the volume of trips into the CBD in the morning. Additional bus services in Monash and La Trobe, such as along Wellington and Blackburn roads in Monash, and between the Hurstbridge and Mernda rail corridors in La Trobe, would help alleviate deteriorating travel times and reliability in these busy employment centres. While rolling out more buses is the answer in highly populated areas, demand responsive services should be introduced in less populated areas. This would give people in these locations a quality service at a much lower cost to taxpayers than a traditional bus. Upgrading buses not only benefits individuals by giving them a quality public transport offering, but also improves the performance of the transport network overall, benefiting everyone who uses it. If we are serious about tackling congestion in Melbourne, it’s time to bring the entire bus network into the 21st century. See the article at The Age website here.